Midlanders on the lookout for some unique hand made gifts for Christmas might like to head along to the Nuneaton Museum & Art Gallery to enjoy the ‘Take 5’ Selected Craft Exhibition which runs until 13th December 2015. This Christmas gift shopping exhibition will show the work of five regional artists. It has been curated by Nuneaton Museum & Art Gallery to showcase a broad range of ‘must have’ crafts in a variety of mediums. Each exhibitor will be offering a range of well-produced and imaginatively designed work. 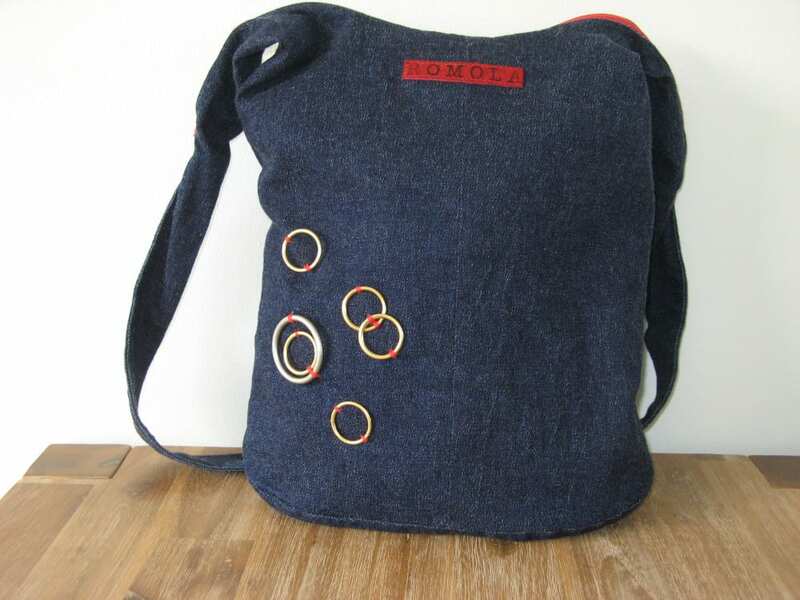 TAKE 5 includes handmade jewellery, bags, ceramics, collages, cushions and objects made form recycled everyday materials. Artists and Makers included in the show are Georgina Brinciotti, Emma Caplin, John Commane, Amanda Glanville and Val Hunt. 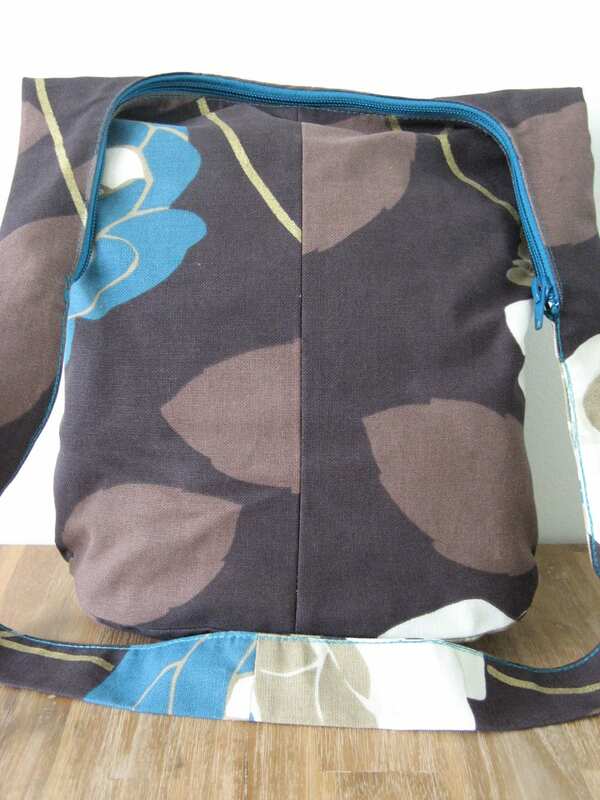 Georgina Brinciotti enjoys working with a range of materials particularly high quality and unusual fabrics making hand crafted bags. Of Italian background, Georgina studied fashion design in her home city of Rosario in Argentina. She went on to take part in the Jeunes Créateurs de Modè competition in Buenos Aires, and then the international finals in Paris where she was awarded the Prix d ‘Incitation. This led to her working in two of Paris’ top fashion houses. Georgina adopted the ‘Romola’ brand and logo name after the novel by George Eliot. Romola is based in renaissance Italy and so she saw using the name as a way of acknowledging her family’s Italian background as well as a chance to make reference to one of her favourite writers. Emma Caplin specialises is creating bright and bold collages, some of which will be in the exhibition as well as cushions and prints which feature images of her original work. Emma has loved design since the age of four when she designed a poster for her playgroup’s jumble sale. She still has that poster. After getting her degree in Theatre Design Emma worked in theatre, film, TV as a Design & Art Director for 13 years. She never forgot her love of design however. In the late 1990s Emma was looking for some artwork to cheer up the kitchen walls of her London flat. Unable to find anything suitable, she decided to create something herself and has been producing work ever since. 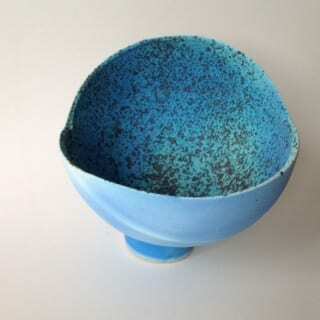 John Commane will be presenting a selection of vessels, vases and dishes. Secialising in working with Raku he will be showing both Stoneware and Raku ceramic works. John started making ceramic works initially for pleasure in the late 1970s, attending evening art classes at North Warwickshire College. He later went on to study ceramics and glass before continuing his studies at Birmingham City University where he gained his degree in Three Dimensional Design (ceramics with glass). His ceramic work explores a variety of firing techniques. In addition to exhibiting as an artist, John has been a teacher of pottery at Nuneaton College. He is also a member of a local group, ‘Art Alert’ and regionally based ‘Escape Warwickshire’. Amanda Glanville will be exhibiting a selection of jewellery featuring her hand made beads. She has been making beads since 1996 and specialises in making extremely small beads. Just one bead can take anything from 5 minutes to an hour to make. Each is formed by melting glass around a fine stainless steel rod. By using this method she has developed a meticulous style of miniaturisation. A significant part of Amanda’s jewellery making involves the creation of headpieces which require light beads which don’t weigh the headpiece down. Amanda is a regular face at some of the UK’s top designer maker fairs and has also take part in open studio events. 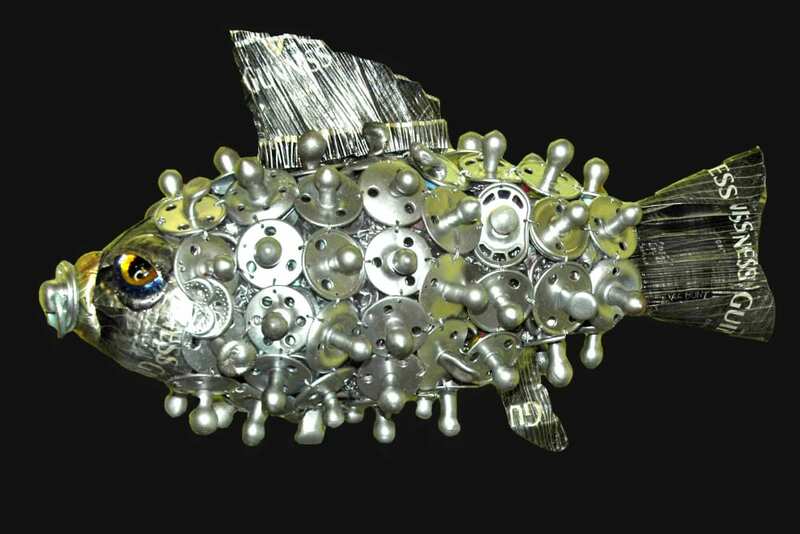 Val Hunt takes discarded everyday objects as her materials, especially drinks can metal, and creates inventive and intricate artworks. Her inspiration very often coming from nature. Val started her career as a primary school teacher. She later decided to follow her dream by taking a Craft Material course at Coventry University. She followed this with a B.A. (Hons) in Art and Craft Studies. 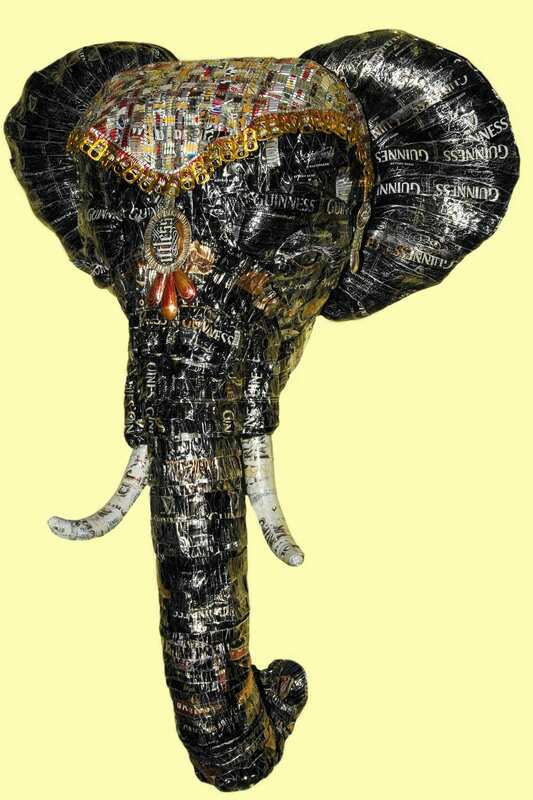 Val has now been working as a creative recycling artist for the past 27 years. She has exhibited all around the UK as well as Denmark, Japan, the United Arab Emirates and the USA. In 2014 she won the Gold Award for Specialist Media in the Craft & Design Magazine Awards after being runner up the year before. Work in the show will be for sale and prices start from just £5! As with all the show and exhibitions at the Museum and Art Gallery, admission is free and there are also our other displays to enjoy throughout the building. « Camden Today in Old London Town.